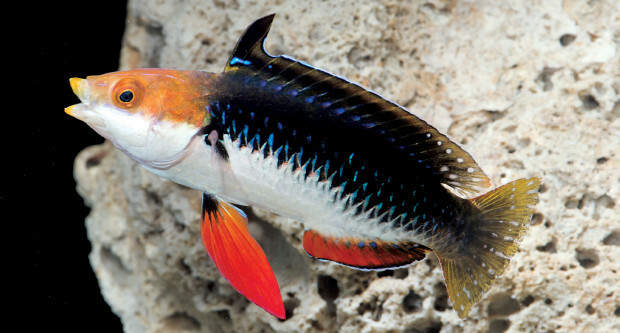 The latest addition to the enormous fairy wrasse genus Cirrhilabrus is an understated fish found in a tiny corner of the Indo-Pacific. Hailing from the reefs of Northern Australia, a region predisposed to seasonal deluges, the Monsoon Fairy Wrasse is aptly named. It’s nomenclature not only alludes to the climate here, but also to Monsoon Aquatics, who discovered and collected the first specimens of this species. The subtle beauty of Cirrhilabrus hygroxerus is a welcome addition, offering some aesthetic respite from the excessive polychromatic flamboyance these labrids are typically known for. 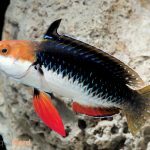 With its mix of quiet colors and demure patterning, this new fish isn’t likely to be a hugely popular option for most aquarists, but no doubt there are some labrid fans out there who are eager to get their hands on a specimen. Cirrhilabrus rubriventralis species group. Click to enlarge. The only known population is native to reefs in the Timor Sea, near the town of Darwin, Australia. 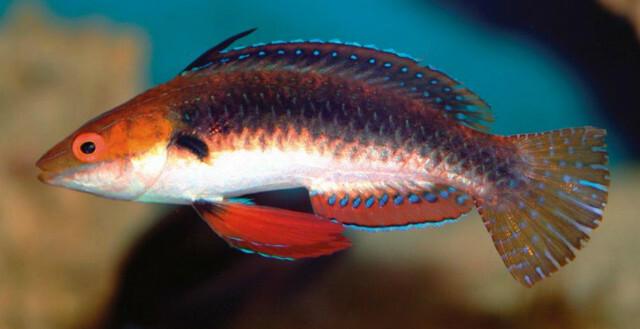 Within the genus, it belongs to the hyperdiverse rubriventralis group, a speciose assemblage of fishes found from the Red Sea to Samoa. 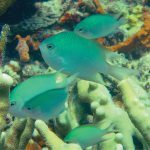 These typically occur in moderately deep, marginal habitats with little coral cover. The rather baroque map which I’ve included here gives a rough idea of their impressive biodiversity, which becomes especially pronounced in the Coral Triangle. The closest relatives of C. hygroxerus are a couple of nearly identical fishes that have yet to be collected for aquarists, C. morrisoni—known only from the remote Ashmore-Cartier Reefs well to the west of Darwin—and C. humanni, another recently discovered fish that appears to be common in the Flores Sea. The differences between these three relate to minor nuances of the fin and body colors, with this new species having an intermediate appearance between the mostly light-colored C. humanni and the dark C. morrisoni. 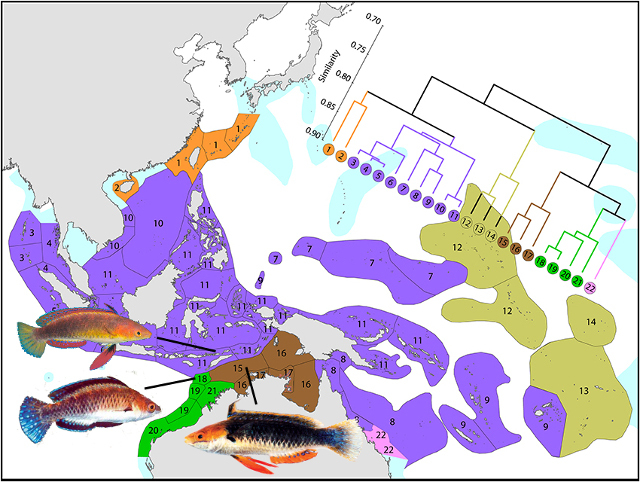 The ranges of these three correlate quite perfectly with a recent analysis of stony coral distributions in the Pacific, giving us an idea for where we might expect to encounter additional populations. 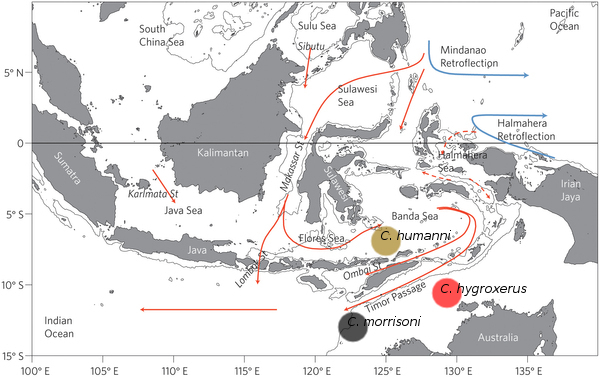 The driving factor encouraging their divergence likely relates to the local streams of the Indonesian Throughflow, a powerful current that funnels water from the Pacific through the various straits formed by Indonesia. 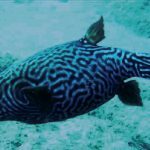 These currents seem to act as barriers for the larvae and adults of many organisms, though, clearly, not all reef creatures are equally influenced by this. The local bathymetry also likely plays its part, as the region just south of Timor marks the boundary where the tectonic plates of Australia and Indonesia meet, forming a deep trough. Monsoon Aquatics has also scored a few specimens of another undescribed species, which I’ve previously referred to as the Banda Fairy Wrasse. This highly variable species, often confused with C. cyanopleura, occurs throughout the islands of the Banda and Timor Seas and up into Sulawesi. 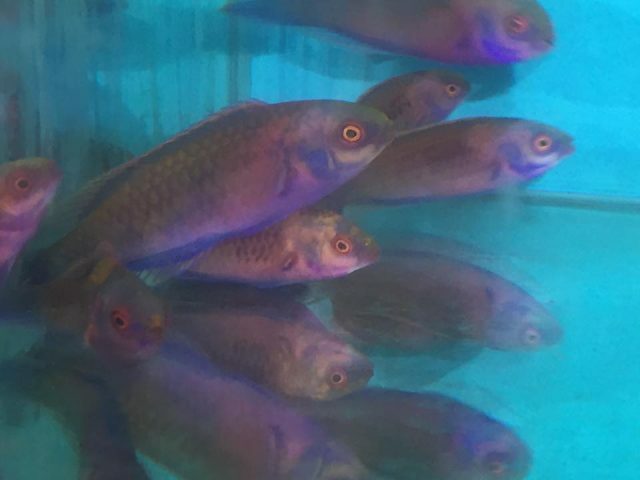 Little has been reported on this fish, likely because of its rather drab appearance and the ongoing confusion with other species in the region. 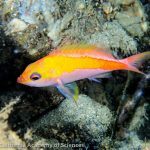 The key traits to look for when identifying this fish are its dark, blue-grey head (especially along the operculum), and the orange hue along the back, hinting at a close relationship to the Orangeback Fairy Wrasse C. aurantidorsalis from Northern Sulawesi. 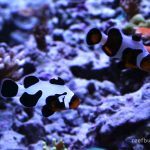 With increased aquarium collection in Northern Australia, we can expect to see both of these fishes with a bit more regularity. Allen, G.R. & Hammer, M.P. 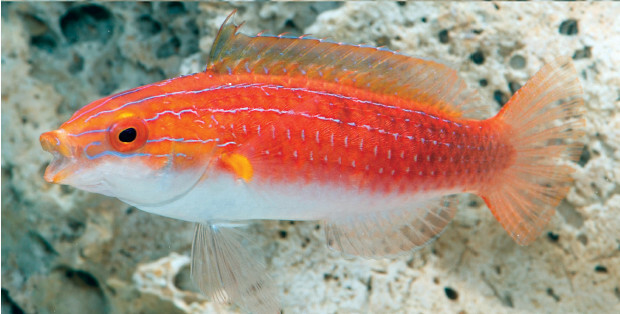 (2016) Cirrhilabrus hygroxerus, a new species of fairy wrasse (Pisces:Labridae) from the Timor Sea, northern Australia. Journal of the Ocean Science Foundation, 22, 41–52.